Is there any real difference between delay boxes in the actual delay feature? Or is it just the differences in the display and the whistles and bells? In other words are the electronics of the actual delay time and release of the transbrake any better or more accurate in any of them? Is the crossover capabilities any better in one than another? Re: Differences in dealy boxes?? my cheap 1 delay no features worked perfect. I only bought the 450 because I needed the bells & whistles. Both worked perfect at their jobs and I still have the single delay in my bracket car, no need for fancy, why waste money. I have used BBC-Dragrace-MSD equipment- 4 sale, personally listed items only. For my babies, we will always remember. In memory of Chris Costa, you will never meet a nicer guy. I will never forget your kindness, when I needed it. As far as that stuff goes, no. Guy we race with had a box with 'dials' to roll the numbers and a dome light to see the numbers with. Worked fine. This is a nice car as well. I didn't know they even made boxes like that lol. Some of us are old and still have our original box. I've never run box before, took a couple of hits at a T&T before. Just wondering if the difference is in the features or in the actual timers. I honestly don't see me having a need for bells and whistles especially to start with. I can see the benefit of some that have bigger displays. I've got a Dedenbear CO2 that I know works and chances are I won't be crossing over. I guess with the RTD box you need to be the slow car or good with math at a track with crosstalk. Last edited by Eman85; 04-17-2019 at 02:39 PM. 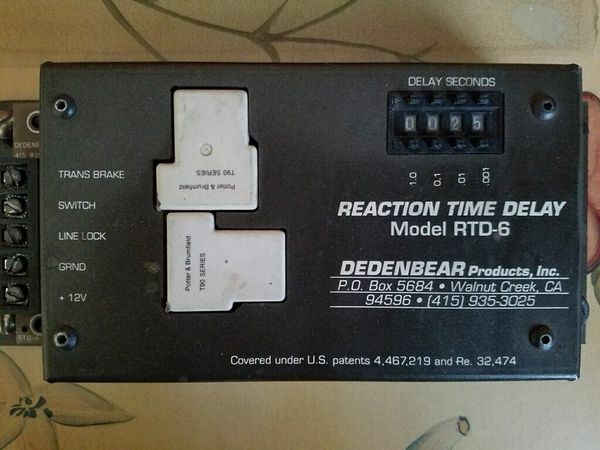 I had the Dedenbear RTD-7, the crossover box and the Thunder box. I lost equally well with all 3!!!!! Best ET so far 8.87 at 151 @ 3200 lbs. Or know how to write a "N" on your window!!! I guess with the RTD7 box you need to be the slow car or good with math at a track with cross-talk. I might be out in left field here, but with the above situation couldn't you just set the RTD up to leave off the 2nd yellow? Less time on the trans brake and 2 step. We are slow at 6.0 so I don,t see us with this problem but it would be an option I think. We have always run PRO bottom bulb, and haven't used our RTD7 box yet so no experience. And what would that do? You must run at a track that will shut crosstalk off, not happening around here. There is one local track that never had crosstalk, really messed with people that came from another track. I guess you could leave off of the second yellow with a RTD if you were the fast car. But that kind of defeats the purpose of a delay box and leaving at the first flash, with crosstalk the top yellow will stay on which will also distract you. At that point might as well leave off of the bottom. I leave first most times in bottom bulb so crossing over wouldn't be much of an issue for me.